Group or Headcount attendance is just a total number of the people in the room. You can enter a group attendance for organizations in which you do not track individual attendance. You can also add a headcount in addition to individual attendance. We use Group and Headcount interchangeably. Your worship service attendance is too large for you to take individual attendance. However, you would like to capture a headcount. You normally track individual attendance for your students. However, one Sunday, all the students met together for a rally and you don’t know which members attended, but you know how many total students were there. You can divide the total among the individual classes and create a headcount meeting for those organizations. You can enter a headcount after recording individual attendance if you discover that there were more people in attendance than are marked on the roll sheet. We do not recommend doing this except on rare occasions. See instructions below. Go to the organization and click the Meetings tab. Click Create New Meeting , (or click the date of the Meeting if it already exists). Check the box beside Group Meeting and click OK .
You will now be on the Meeting page. 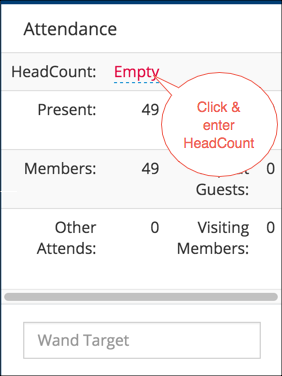 Click beside HeadCount where you see edit and enter the count for the Meeting. Add any guests for whom you get visitor information. When entering a headcount, use the grand total of people in the room, not just the difference between those counted present and the total. After entering the individual attendance, go to the Attendance section on the meeting (where you see the individual attendance count), click beside HeadCount and enter the total number of people who attended. Click the blue check mark to save changes. Your church may have a setting that forces you to change the meeting to a headcount meeting before you can enter the headcount. If so, just click where you see the Meeting Type and change it from Regular to Group (headcount) and then click OK . Then you can enter a headcount.